Less is more. 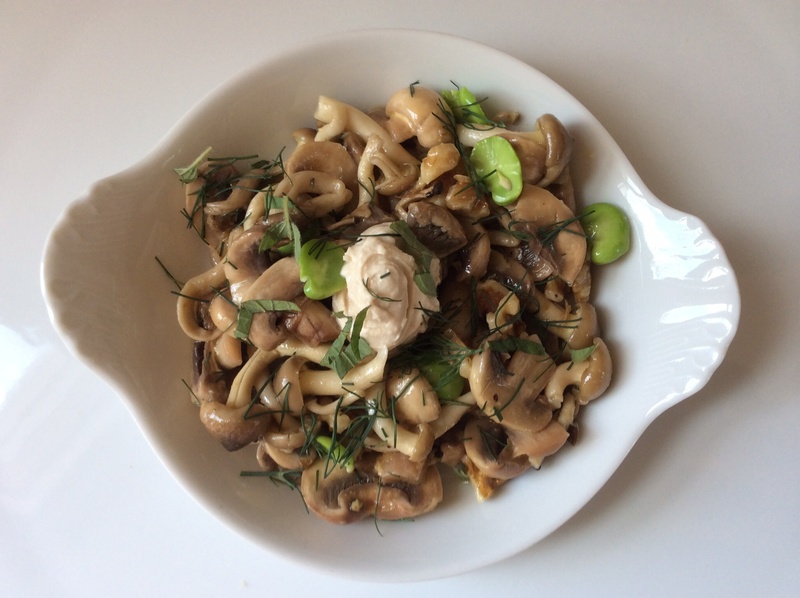 I find this is often true with recipes and ingredients, and this recipe has a short ingredient list with big flavor and texture. Kohlrabi is in the Brassica family along with cabbage, broccoli, cauliflower, and Brussels sprouts, and is a rather amusing looking little devil. 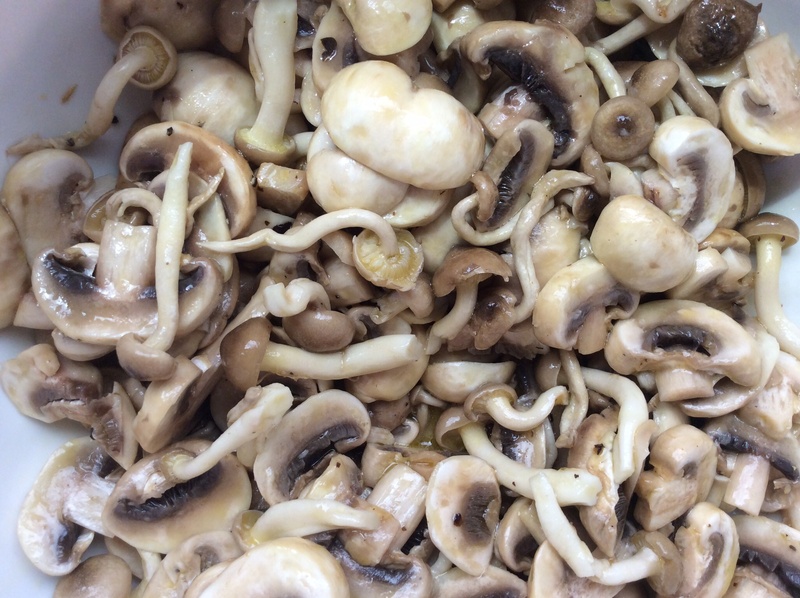 It has a subtle, earthy flavor, and its texture is versatile: great crunch raw, or sweet tenderness roasted. In this salad, from Michael Anthony’s terrific book “V is for Vegetables”, it is sliced super thin and dressed with toasted walnuts and walnut oil & lemon juice dressing. The trick to a salad like this one, or any where a vegetable is called to be thinly sliced, is a mandolin. I very much enjoy weilding a knife on a regular basis and can’t deny the consistent and ultra thin results from a kitchen mandolin. My favorite is a simple, light, Japanese one from Benriner ($23 on Amazon). Once you trim and peel the kohlrabi, slice, very carefully, onto a cutting board. A little whisking and then gently fold in the kohlrabi and walnuts. The recipe calls for toasted walnuts, which is I know sometimes feels like an extra step, but it is always worth it. A hot oven at 400F for 3-4 minutes or a 2-3min in a hot, dry pan on the stove will bring out their best flavor. Whisk together the lemon juice, walnut oil and olive oil in a small bowl, then add lots of salt and pepper. Combine the kohlrabi and walnuts in a medium bowl. Gently toss with enough of the vinaigrette so that the salad is quite moist, separating the kohlrabi slices. I also like to add freshly grated Parmesan right before serving. 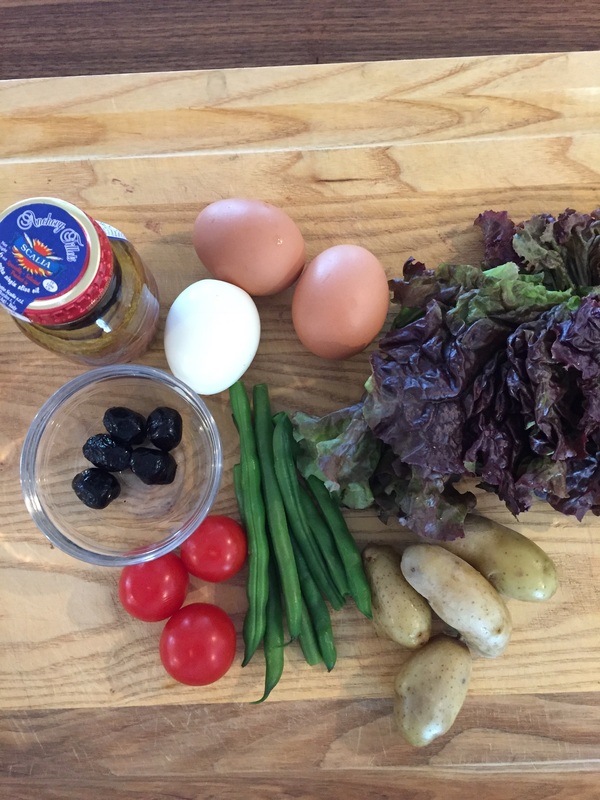 A Salade Nicoise is a classic French salad named after its birth city of Nice (pronounced neese). I have always loved it for sentimental reasons, but it’s perfect hot-weather fare because every ingredient can be prepared in advance and kept cool, and then you simply assemble the plate. It’s crunchy and salty and zippy, and when you add a pinch of nostalgia, I could make a case that it’s the greatest salad of all time. In typical French fashion, there is often great debate about what is traditional and what is not in certain classic dishes (in this case, raw or blanched green beans, tuna or anchovies), but I will simply represent the first one I had over twenty years ago, as a college student in Grenoble at an outdoor cafe table, as it remains the one I still make today. There are easy alterations but this is my standard. 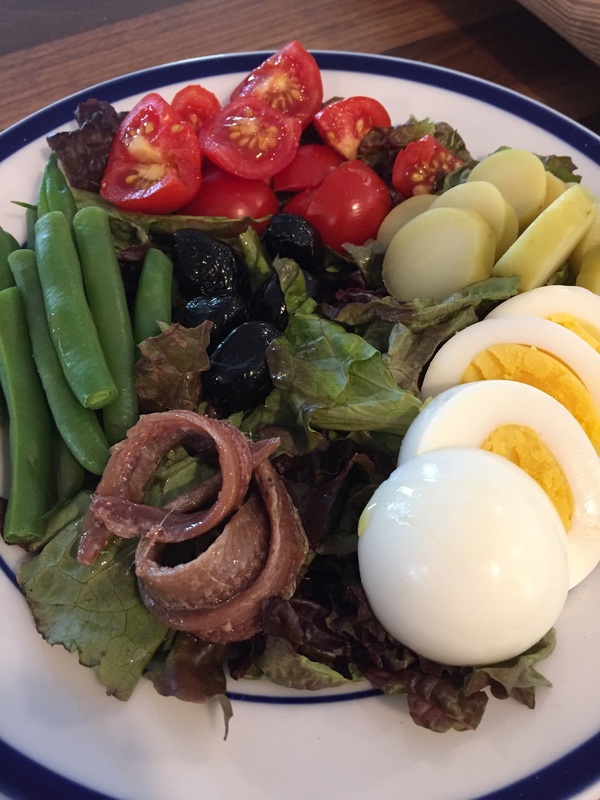 The salad is quite simple, it’s roughly six or seven ingredients and a dressing, but it’s about each ingredients’ quality and preparation that makes it a classic. Whisk & taste – This is the magic. One or two fingerling or small potatoes, boiled – Optional, but since I’ve never met a potato I didn’t like, I add them; also, you can boil the potatoes and add the green beans for the last minute to save time. 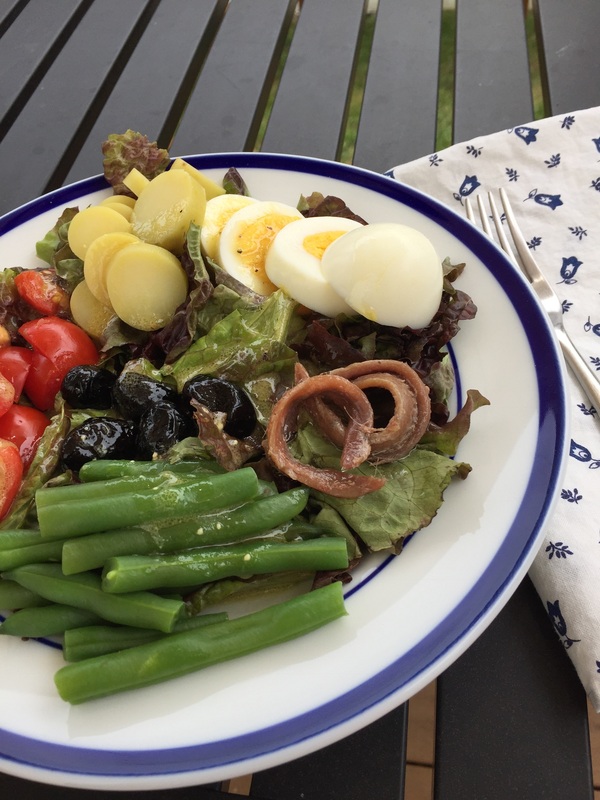 When you are ready to plate, tear the lettuce into bite size pieces and top with peeled, sliced egg, sliced potato, sliced tomato, anchovy fillets, green beans, Nicoise olives at the center. Add one or two tablespoons of dressing (always start with less). Et voila! The best extra ingredient, if you’ve got it, is warm alfresco weather to sit and enjoy it outside. Place 1-2 eggs in water in pot, bring to full boil, put the lid on, turn the heat off, remove pot from burner and allow to steep for ten minutes. Drain eggs and run under cold water. Boil potatoes & green beans: Add two or three potatoes to pot with pinch of salt and bring to boil, allow to boil steadily but not furiously for roughly 20min, checking after 15min (especially if potatoes are small) with a fork for tenderness; add green beans for last minute and drain. This is one of my favorite winter salads (or spring, or summer, or fall) because it can be chopped and whisked together in minutes and has a short ingredient list: endive, avocado, olive oil, Dijon mustard, vinegar, lemon juice, salt & pepper. See how they nuzzle? I love contrasts – in life, in opinions, in friends – and this is no exception. Endive is such a treat: if you’ve never worked with it, buy one and toss into your next salad for a great crispy crunch. Or slice in half lengthwise, braise in a bit of butter and olive oil, then sprinkle with a touch of sugar. Delicious. And avocado adds silkiness and a bit of good fat to the marriage. For this salad, slice the endive lengthwise and then cut into half moons. Halve the avocado (remove pit), make grid with a knife, then scoop out with a spoon. Both can head into a medium sized bowl. In a small bowl, whisk together the vinaigrette (a basic french one always has zesty Dijon mustard), and pour over the endive and avocado, stirring gently. Enjoy! Add both to medium sized bowl, pour vinaigrette over top, stir gently. 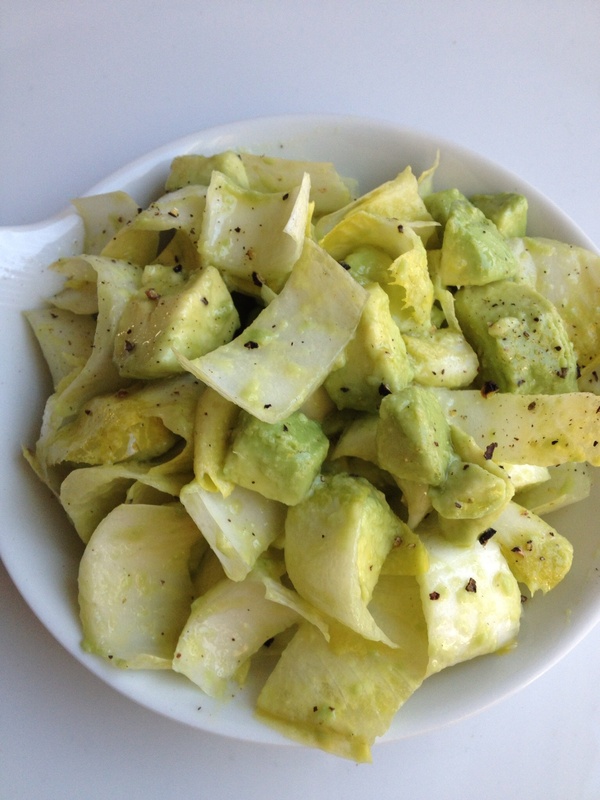 Enjoy immediately (both avocado and endive brown quickly once cut or sliced). Here is a perfect dish for trumpeting Spring: crunchy vegetables, bright lemon juice, spicy grated ginger and sweet honey – like a deep breath of fresh air after a long winter. I stumbled upon this recipe on Food52: I stopped on this one when I read ‘raw sweet potato’, intrigued, and made it that afternoon. Yum! Indeed, the starchy sweet potato acts like jicama might: sturdy and crunchy, as the backbone for the other sweet and spicy components. The only labor for this raw salad is the dicing, which I find enjoyable, but which can be easily done with a mandolin. This recipe can officially kick off picnic season, with the extra scarf and sun hat of course. Welcome Spring! 2. In another bowl, combine sweet potato, apple, celery, scallions, radishes, sesame seeds and cilantro. Pour dressing over and toss gently. Happy new year! I really enjoy this time of the season, the lull after the holiday excitement, and the refocusing on the new year ahead. The weather is cold and bright here, so I see this zesty, fresh salad as a nice accompaniment to January: crisp, spicy and comforting. Red onions get a bit melbowed by a rice wine vinegar, sugar and sunflower oil dressing, but keep their crunch to contrast with the snappy cucumbers and spicy ginger. Enjoy and best wishes in 2016. 1. 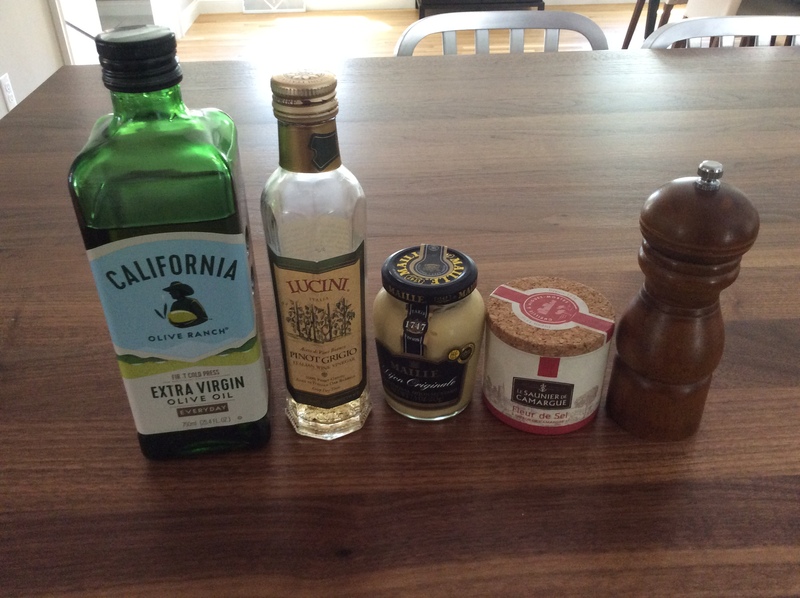 To make dressing: whisk together all the dressing ingredients in a medium mixing bowl. 2. Add sliced red onion, mix well and leave aside to marinate for about an hour. 3. 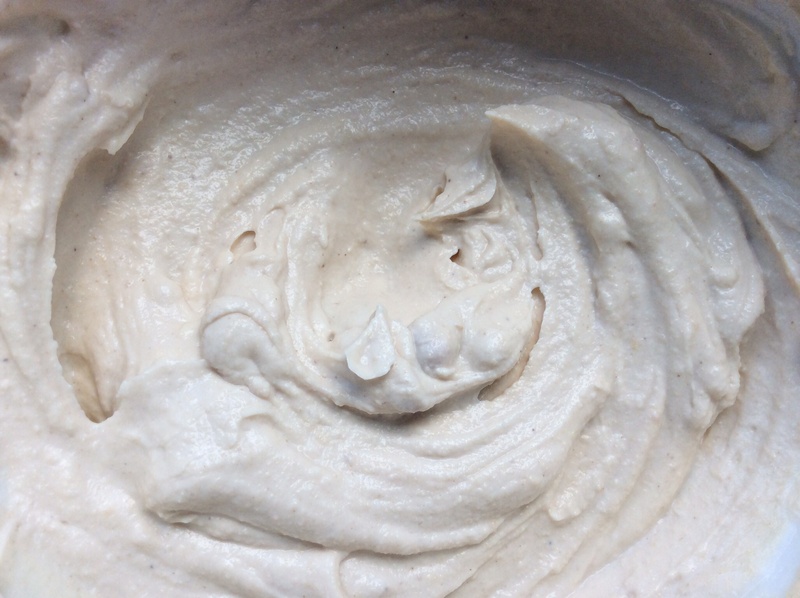 Place the ginger and salt in a mortar and pound well with a pestle. Add the garlic and continue pounding until it is also well crushed and broken into pieces (stop pounding before it disintegrates into a paste). Use a spatula to scrape the contents into the bowl with the onion and dressing. Stir together. 4. Cut the cucumbers lengthways in half, then cut each half on an angle into 1/4″ thick slices. Add the cucumber to the bowl, followed by the sesame seeds and cilantro. Stir well and leave to sit for 10 minutes. 5. Before serving, stir the salad again, tip out some of the liquid that may have accumulated, and adjust the seasoning. This is one of my favorite, quick salads: crunchy endive and creamy avocado, stirred with tangy & peppery french vinaigrette. Endive is so super versatile, it’s terrific either fresh or braised, and avocado is such a super food, I love them together. 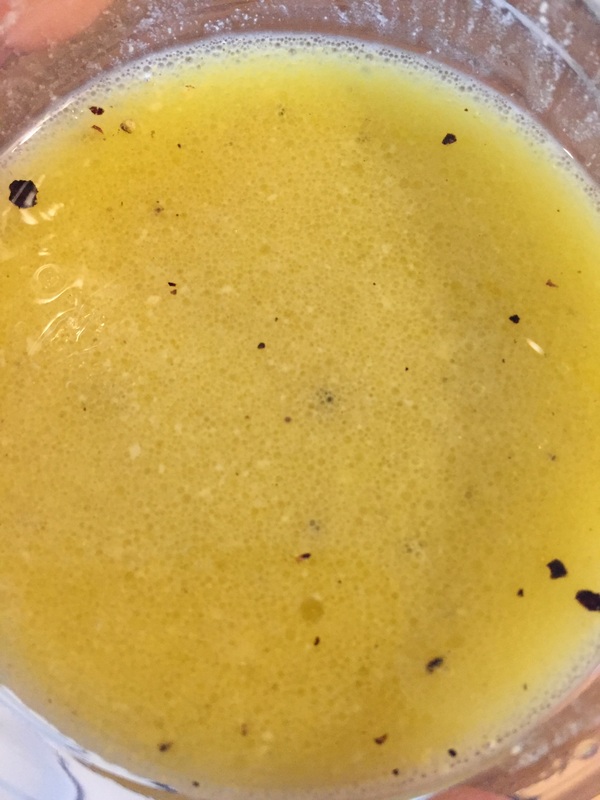 My favorite french vinaigrette unites them beautifully, but I also use it on shredded carrots, steamed green beans, or adding a touch to egg salad. What a lovely little dish, thanks to Mr. Yotam Ottolenghi once again. 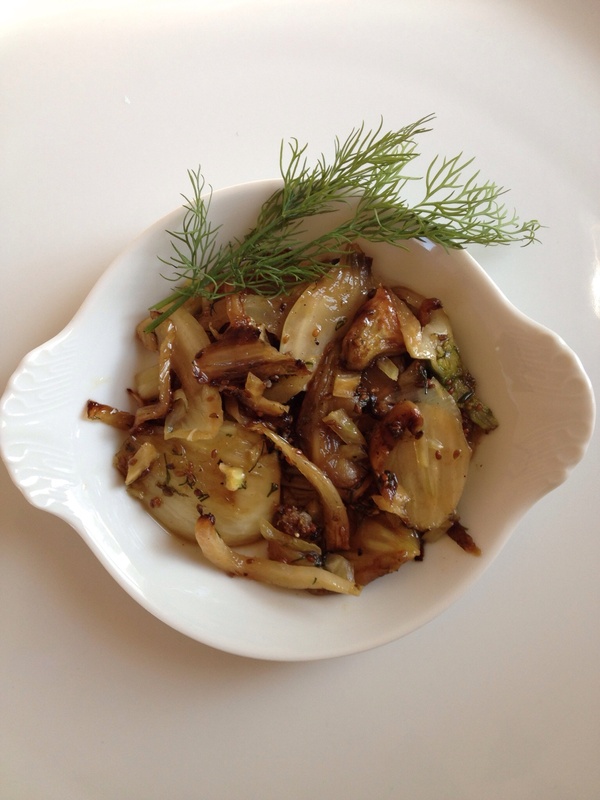 Lightly browned fennel slices, removed from the pan briefly in order to add coarse sugar and fennel seeds, then returned to the pan to caramelize gently. Remove from heat, mix carefully with a touch of garlic and chopped dill, then plate and add goat cheese (excluded here), lemon zest and fennel fronds. It is sweet and salty, tender and crunchy and start to finish took about 20 minutes: an A+ in my book. 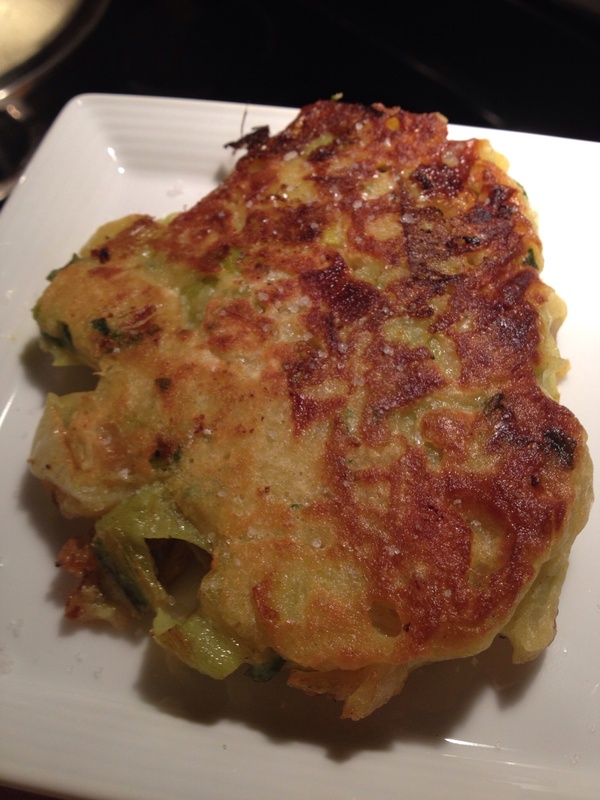 These fritters are officially in my rotation! Full of sweet, oniony flavor and light, light texture from various incorporations of baking powder (making the batter fluffy) and warm, lovely spices thanks to the coriander, cumin, turmeric and cinnamon. I altered slightly from the Plenty cookbook but you can find the original recipe here: http://www.theguardian.com/lifeandstyle/2008/feb/02/recipe.vegetarian Make them soon, or I will make them for you! 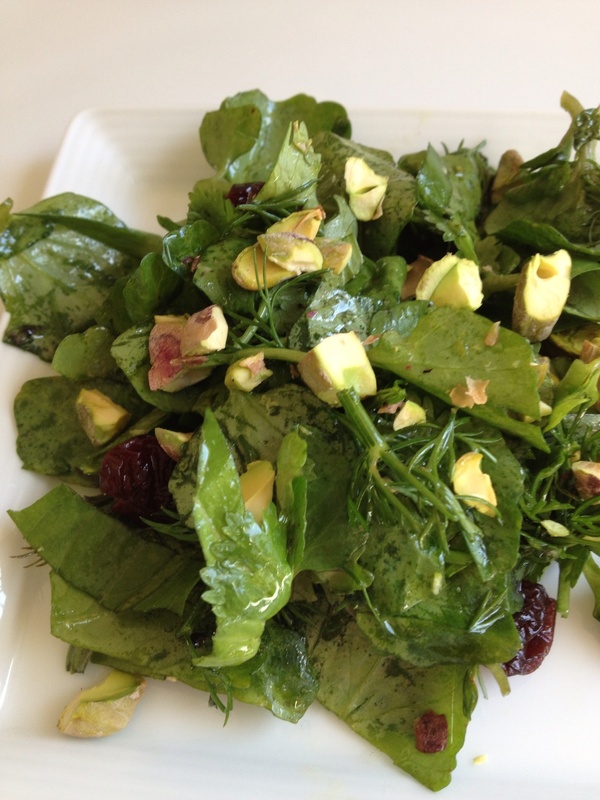 Watercress, dill, cilantro, basil, tarragon, orange blossom water, fresh squeezed orange, pistachios and dried cherries. Inspired by Yotam Ottolenghi’s Watercress salad. What an absolute awakening!